Ms. Lorena Atiyas Lvovsky is Researcher at the International Institute for Counter-Terrorism (ICT), and serves as the ICT External Relations Manager, facilitating ICT cooperation with academic, security and governmental bodies. 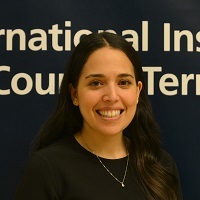 Ms. Atiyas Lvovsky holds a BA in Government, graduating with distinction, from the Lauder School of Government, Diplomacy, and Strategy at the Interdisciplinary Center (IDC) Herzliya, Israel. Ms. Atiyas Lvovsky is currently pursuing a MA with a Thesis from the Lauder School of Government, Diplomacy, and Strategy at the IDC Herzliya, Israel. Terrorist organizations use the Internet for a wide range of activities, including the dissemination of messages, making contact, recruitment of manpower, fundraising, propaganda, incitement, psychological warfare and intelligence.